« Have I Become the Enemy? I was thrilled when Larry asked me to write about my experience, as it pertains to my double life as both a playwright/theatre maker and literary manager at The Theatre @ Boston Court (I’m actually a co-lit manager, along with another theatre maker, Emilie Beck). After the thrill passed, a bit of dread set in. How would I address both the joys and challenges of my position(s)? How would I possibly, in 3 or 4 paragraphs, manage to communicate the complicated nature of helping to decide seasons while also trying to advocate for my own work out in the world? How would I also manage to fit in plugs for my own upcoming shows (“Cave…A Dance for Lilith”, a co-production between theatre dybbuk and LA Contemporary Dance Co., opening this November)? Okay, one down! What I haven’t gotten to mention: The really great benefits I’ve received as a member of the Artistic Staff at BC. I get to engage in great and in-depth discussions with colleagues about not only the specific plays we are considering, but the general landscape of the American theatre. I get to read a ton of plays of all sorts, which then helps me look at my own work in new ways. I get to attend theatre gatherings as both a playwright/director and a literary manager, giving me many points of contact with my fellow artists. Since Boston Court has a focus on new plays, I also get to apply my dramaturgical skills by offering feedback on work as it develops towards production. Again, this can often reveal the kinds of questions I need to be asking of my pieces. Are there challenges I haven’t touched on? Of course! The biggest of these is probably the fact that I have so many close colleagues and friends who are wonderful playwrights whose work is not included in the seasons I help to choose, for any of the myriad number of reasons I alluded to above. These are smart people who I treasure and so it can be challenging, if only sometimes in my own head, to navigate through the waters of these personal and professional relationships. Also, I struggle with time management. How do I balance dedicating my energies to others’ works and responding to queries and submissions with the needs of my own pieces and theatre dybbuk? I imagine that I do it like anyone else who has a variety of commitments – Imperfectly. Thanks for reading and I do hope you will come check out Boston Court’s summer production of “The Government Inspector”, a world premiere adaptation by Oded Gross, co-produced by Furious Theatre Company. I also hope that I will see you in November for the big dance theatre shebang that I and my collaborators are putting together. Happy making! Aaron Henne is a Southern California based theatre maker and artistic director of theatre dybbuk. His plays include King Cat Calico Finally Flies Free! (published by Original Works Publishing) and Sliding Into Hades, which received the LA Weekly Awards for Playwriting and Production of the Year. Aaron has worked in various capacities with companies such as Culture Clash, The Colony Theatre, Center Theatre Group and The Theatre @ Boston Court, where he serves as Co-Literary Manager. 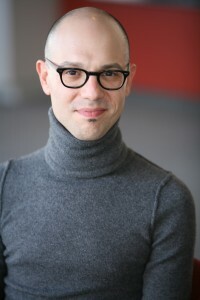 His exploration of machines and their relationships to humanity, Body Mecanique, was developed and produced by LA Contemporary Dance Company. Mr. Henne’s exploration of Kafka’s “The Castle”, A Man’s Home, and Mesmeric Revelation, a clash of science and mysticism, were both developed and produced by Central Works in Berkeley, CA. His playwriting process book, You Already Know, is available through Writ Large Press. He teaches writing for the Playwrights’ Program at The Robey Theatre Company, is a mentor at Otis College of Art and Design and has taught storytelling workshops at Disney and LucasFilm. Aaron is a proud member of The Playwrights Union and board member for The Association for Jewish Theatre. This entry was posted in Guests and tagged Aaron Henne, Larry Pontius, Lit manager, Playwrights Union, playwriting, rewriting, theater, theatre, Theatre @ Boston Court, Theatre Dybbuk, writing. Bookmark the permalink. Post a comment or leave a trackback: Trackback URL.